"Bararic Vast and Wild is the crowning jewel of the Poems for the Millennium series, just that it proposes a deep othering of the entire project, a movement beyond the radically reconceived visionary canon of poetic invention to an unchartered realm beyond any literary canon formation, from Blake's chartered streets to something that proposes a reimaging of the literary in its re-grounding in the uncharted. … The fact is that the mad eclecticism of this anthology is its greatest virtue - it moves in leaps and bounds, like Nijinsky on peyote. It defies any category previously existing and yet as a reader I feel I get it, get it again, and get it over and again, as I am pulled in different directions. In a way, this book works, even more than Rothenberg's other anthologies, as an epic poem - along the lines of a work, as Walter Benjamin imagined, composed just of quotations. The constellation - or set of constellations - is stunning and unexpected - the connections are themselves visionary or outside rational historical plotting. What this does is to make a book magically readable - not a text book, not a succession of cultural touchstones you "ought" to know, but an autonomous reading experience that changes everything page by page. "Rothenberg, and his co-editor, John Bloomberg-Rissman, now turn their attention to poets who may not have thought of themselves as poets, poems that blur into image and calligraphy, texts that aspire to the condition of disappearance. Various terms for such work come to mind-avant garde, art brut, outsider art, "folk" poetry, "subterranean." 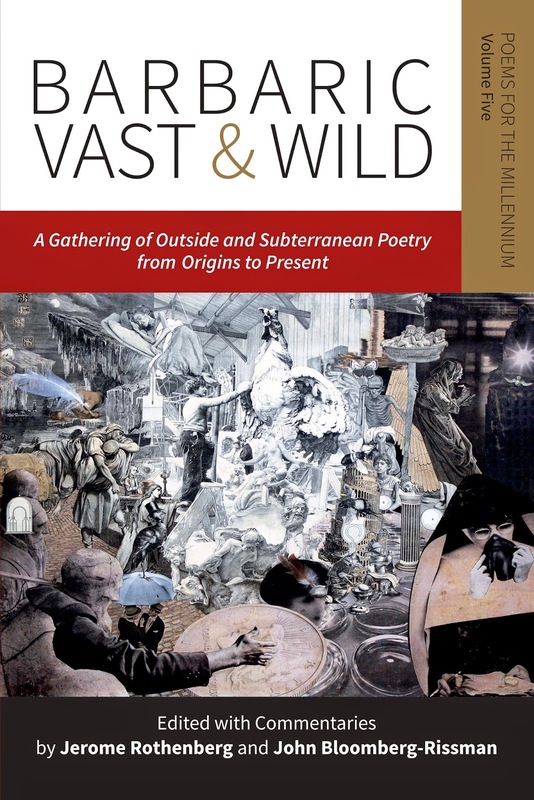 … By bringing together texts from heretical religious traditions, inhabitants of mental institutions, folk or isolated cultures and placing them alongside poetry by more canonical poets who were themselves at times estranged or mad makes for a much more diverse, complex way of looking at the meaning of "outsider" art."